Our Favorite Black Friday Deal At Macy’s Is $18 – Today Only! Jeans will always be a wardrobe staple and we love them in every cut, color and wash! They bring such a casual yet stylish vibe to any outfit and can be worn in a variety of settings so of course we need a fine selection to play with. Check out the denim deal we spotted on sale plus the color options we love the most! We’re currently obsessing over these 65% off Style & Co Curvy-Fit Bootcut Jeans! This style is a great way to depart from our skinny silhouette obsession. The wider leg of these jeans offer up a lovely alternative that looks sophisticated yet approachable and fun. See it: Get the Style & Co Curvy-Fit Bootcut Jeans (marked down 65 percent off its original $49, now $18) while so many colors and sizes are in stock. These Style & Co Curvy-Fit Bootcut Jeans accentuate the figure thanks to a curve-hugging upper portion but they still flare out in a really festive yet still simple way thanks to the bootcut leg. The black pair above is perfect for wearing to work when we want to dress down with jeans but still look appropriate at the office. They can be worn with sweaters or dressy blouses and still serve up a stylish, professional look. Sizes range from 2 to 18 and include regular, short and long cuts. 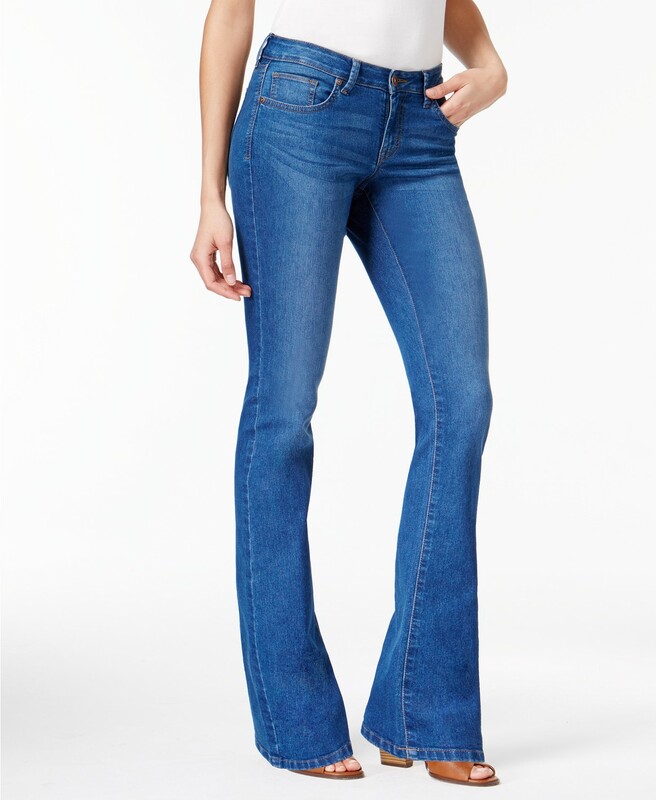 Our favorite color of these Curvy-Fit Bootcut Jeans is this Capside finish which is a very rich blue shade. We’ll wear this pick with pointed toe pumps and a one-shoulder sweater or an oversized crew neck sweater and flat ankle booties. They’ll also look great with a shaggy cropped sweater and open toe ankle booties. Whenever we want to relax and still look cute, we can pull on a stylish velour hoodie and step out wearing low-top sneakers for a really simple yet glam ensemble. Looking for another option? 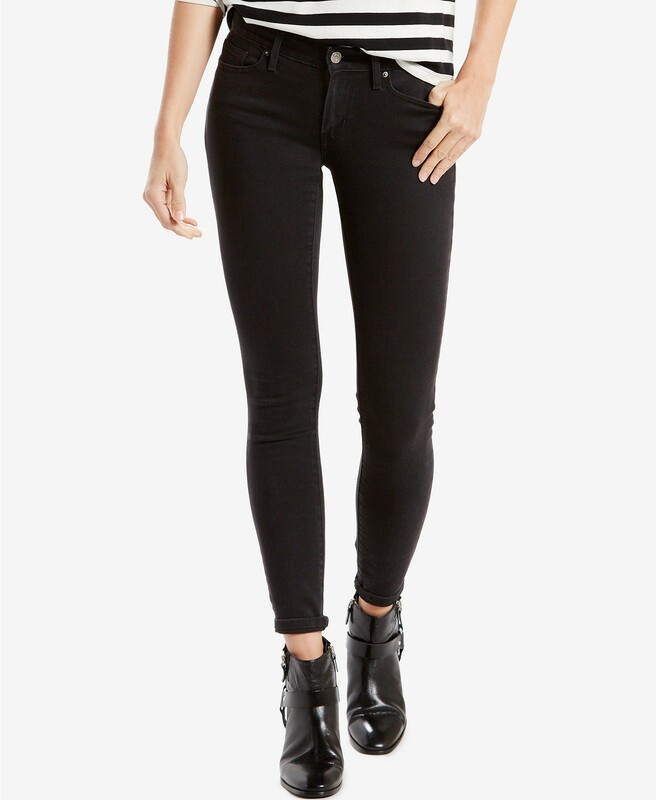 These Levi’s 711 Skinny Jeans are on sale at Macy’s and come in 15 different colors! They have a mid rise design, belt loops and a button closure with a zip fly. Sizes range from 24 to 34. Our favorite style is the black version. See it: Grab Levi’s 711 Skinny Jeans (marked down 40 percent of its original $59, now $35) while they are in stock in so many colors and prints. Black skinny jeans are an absolute must-have for any fashionista! They can easily be incorporated into an office look on casual days, plus they look banging over a lacy bodysuit on a night out. We will be wearing these with all-black ensembles featuring a cozy sweater, trench coat, ankle boots and a fun statement bag. Still, they can also be paired with tops that are in light pastel colors or the deep jewel tones we love wearing in the fall. We also love wearing metallic or sequin tops with the leg-skimming style! The possibilities are truly endless. Shoppers who love a dark blue jean look will want to scoop up the Cast Shadows wash! The smooth tonal stitching gives these jeans the perfect simple touch while maintaining their versatile appeal. We will wear this classic pair with striped sweaters and black or brown over-the-knee boots! The trousers will also look great with wedge bootie sneakers and the classic long sleeve white T-shirt topped by a longline cardigan or trench coat in a fun color. Our denim collection is about to get a major upgrade with both styles of these gorgeous jeans! Try the Style & Co Curvy-Fit Bootcut Jeans (marked down 65% off its original $49, now $18) while so many colors and sizes are still in stock! Need an alternate silhouette? Grab Levi’s 711 Skinny Jeans (marked down 40% of its original $59, now $35) while they are in stock in so many colors and prints! Plus, be sure to check out our list of Black Friday deals you can shop today!